Bhubaneswar, Odisha, India – The air was clear, the sun was shining and Bhubaneswar’s broad roads were relatively uncongested as His Holiness the Dalai Lama drove to the campus of the Kalinga Institute of Social Sciences (KISS) University this morning. On the last stretch, the road was lined by smiling students, some holding placards inscribed with greetings, welcoming him to the University. On arrival, he was received by Dr Achyuta Samanta, founder of KISS and KIIT, and university officials. Groups of energetic dancing drummers lined the path as he entered the campus. He was invited to garland a statue of the Buddha, then unveil a plaque and plant a sapling that will commemorate his visit. His Holiness drove to the stage, set up at the head of large field, in an electric golf cart. Once again the road was lined by students, some performing yoga, others dancing and playing drums. He clearly enjoyed this display of ebullience. Reaching the stage he was invited to light the lamp to inaugurate the occasion. 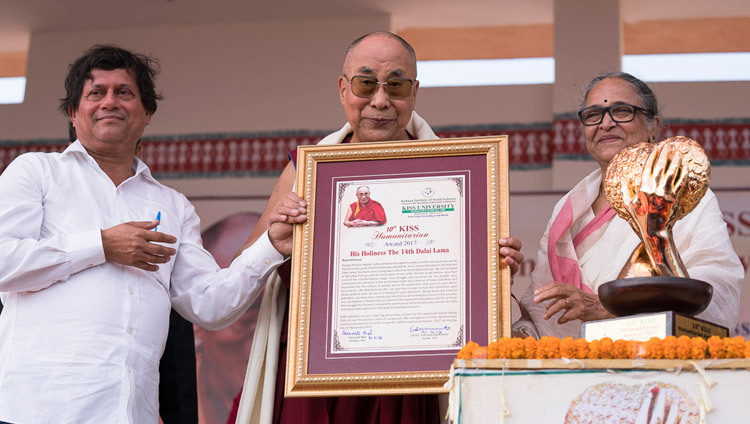 Speaking in Oriya, Dr Samanta introduced His Holiness to the audience of more than 25,000 students, explaining what the words Dalai and Lama mean and what the training of a Tibetan Buddhist monk entails. Mentioning that he invited His Holiness to come to the University in 2015 he declared his happiness in being able to actually welcome him at last. He then proceeded to offer His Holiness the 10th KISS Humanitarian Award before inviting him to address the students. His Holiness began as he usually does by greeting the older and younger members of the audience as brothers and sisters, telling them how happy he was to be among them. “I always consider that the shape of the future is in our hands,” he observed. “The past is past and can’t be changed, but the future has not yet arrived. Young people like you have the opportunity and responsibility to shape it by creating a better world. Despite many remarkable developments, the 20th century was an era of violence, a time when, sadly, scientists’ brilliant brains were put to destructive use. For example, they participated in the design and manufacture of nuclear weapons that were used twice against Japan. “Although killing has continued since the beginning of the 21st century, steps should be taken to make this a century of peace. Since peace is destroyed by negative emotions like anger and jealousy, we have to find ways to develop inner peace if we are to create peace in the world. It’s worth asking yourself whether you feel happy when you’re angry. Anger and extreme irritation all too easily lead to violence. So, how are we to reduce anger? By increasing our sense of love and compassion. “Scientists have evidence that basic human nature is compassionate. If it were not, there would be no hope. However, our common experience is that we are all born from a mother and survive in her care. Common sense tells us that even if our neighbours are poor, if they shows signs of affection, we think of them as good neighbours. What’s more, anger and violence bring disaster. They make you lose your peace of mind. They spoil the atmosphere wherever you are. “When we are young we appreciate love and compassion, but as we grow up we become more interested in money and status. One of the reasons for this is that modern education is inadequate because it tends only to have material goals with little scope for inner values. “It’s worth reminding ourselves that all 7 billion human beings are physically, mentally and emotionally the same. But if we allow ourselves to think in terms of being privileged or under-privileged, belonging to higher, lower or no caste, it will only fortify division. This is unhelpful, out of date and undemocratic. Reminding ourselves of the oneness of humanity, that we are all the same in being human, is, on the other hand, a great source of confidence. In the auditorium of the Kalinga Institute of Industrial Technology (KIIT) nearby, His Holiness mentioned to a capacity crowd of 1600 that he considers the Buddha to have been a great thinker and something of a scientist. He remarked that he thinks of himself too as half a monk and half a scientist. He highlighted one of the unique aspects of the Tibetan Buddhist Tradition—that, in addition to revealing profound philosophy and psychology, it embraces reason and logic. It is this that makes it of interest to scientists. He reported that the Buddha’s own advice to his followers not to rely on blind faith, but to subject his teaching to reasoned investigation, has allowed him to reject traditional Buddhist cosmology. Reverting to the shortcomings of modern education by itself, His Holiness repeated how important and more realistic it is to incorporate a secular approach to universal values. In his answers to several questions from the audience, His Holiness noted that all human beings wish to be happy and that happiness is their right. He mentioned the recent publication of two volumes, the ‘Compendium of Science’ and the ‘Compendium of Philosophy’, derived from material extracted from the Kangyur and Tengyur, the collections of translations of largely Sanskrit Buddhist literature. They focus on the science of the mind and correct views based on reconciling the gap between appearance and reality. After lunch, 1600 Tibetans from the Phuntsokling Settlement in Chandragiri filled the KIIT auditorium. To begin with the Settlement Officer gave a report, mentioning the start of the settlement in 1963 on 849 acres of land, when the community included 300 monks and nuns. He described the development of schools, the construction of a hostel for old people with the support of Tibetans in Switzerland and the offer of 4 post-graduate places for Tibetan students at KIIT University. His Holiness regaled the audience with the importance of study for personal satisfaction and to preserve the Buddha’s teaching. He told them that 40 years ago he urged monasteries and nunneries that had previously concerned themselves mostly with performance of rituals, to develop programs of study. One result was that last year 20 nuns were awarded Geshe-ma degrees in recognition of their completing their rigorous Buddhist education. Similarly, Penor Rinpoche’s determination to encourage study and debate at his monastery Namdrolling in South India, contrary to the advice of Chatral Rinpoche, has meant that today there are a good number of well-qualified Nyingma Khenpos. Then, remarking that he might not visit them again so often, His Holiness decided to lead the community in a brief ceremony for generating the awakening mind of bodhichitta. He took time to describe the Buddhas, bodhisattvas, Indian and Tibetan masters they could visualise before them in witness to their aspirations. He encouraged them with the advice that all the happiness in the world comes from ensuring that others are happy. 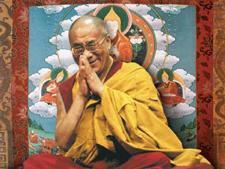 He ended by giving transmission of the mantras of Avalokiteshvara, Manjushri and Tara. Many in the crowd clamoured to receive His Holiness’s smile or touch as he slowly left the auditorium and made his way to his car. Tomorrow, he will travel on to Kolkata.